End of Thorps Quarry Road. 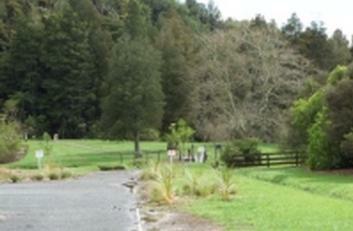 100 hectares of native bush rising 225 metres above the Wairoa River. Variety of walks to choose from. Facilities include picnic area, walks, lookout, public toilets & parking. Walk past Camp Sladdin, over the Taitaia stream and follow the path to the walking tracks, or a gentle stroll to the disused Thorps Quarry with is small waterfall. A steep walk on formed tracks through native bush climbing to 225 metres, where you will be rewarded with a 360° vista from the viewing platform. Look out for the Auckland Sky Tower, Waitakere Ranges, Hauraki Gulf (including Little Barrier Island on a fine day), Coromandle Peninsula, Hunua Ranges and of course the Clevedon Valley and Wairoa River. The bush has a varied array of native flora which include kauri, puriri, kahikatea, taraire, lancewood and nikau. Watch for the NZ pigeon perched in the trees and listen for the sounds of the tui and warbler. For keener walkers, follow the Te Araroa Walkway marker (just below the summit in the right hand track) which will take you over the ridge (with outstanding views down the Wairoa River) into the Brookby Valley. This is a one way track only.